Babcox Publication's Mary DellaValle reports on WORLDPAC's 1st Supplier & Training EXPO (STX) in the October 28, 2009 issue of aftermarketNews.com. 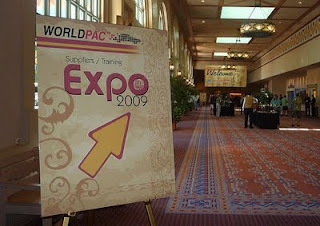 WORLDPAC Hosts First-Time Supplier & Training EXPO: Successful Event Supported Customers Through Specialized Training. ORLANDO, Fla. -- Continuing its tradition of bringing high-quality, innovative products and services to the import marketplace, WORLDPAC held its first-ever Supplier & Training Expo, Oct. 23-25 at Disney’s Coronado Springs Resort in Orlando, Fla.
More than 500 shop owners and technicians, representing 423 shops from 43 states and Canada, attended the three-day event that provided a customized lineup of technical and business training, conducted by industry’s most respected training instructors, including some from the WORLDPAC Training Institute (WTI). Considered a success from a number of vantage points, the core of the program was technical training — detailed, vehicle-specific repair information to help techs better diagnose and service late-model imports. The WORLDPAC Supplier & Training Expo earned high marks from import repair specialist participants, who realize that increased knowledge of vehicle systems and diagnostic acumen will help ensure the continued success of their independent repair shops. Visit AMN's WORLDPAC Hosts First-Time Supplier & Training EXPO article to view full text and a photo slideshow of the event!